Firstly you are an Underwater Photographer, with a desire to not get sea-water in or on your camera? Then you must also fit one (or more) of the following criteria. You are not married (or in a de-facto relationship for taxation purposes) and don't understand what/why/how women place absorbent things in their underpants once a month. You are under the age of 18 and don't want to know what women put in their underpants once a month. Your married and have never asked what/how your wife puts in her underpants once a month. Promise to only view the photos below this line when your girlfriend (that you only met last week) is not around. 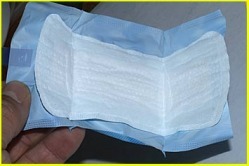 This is a packaged 'Slimline' Ladies Sanitary Napkin. Around $3 - $5 for a pack of 10. This is how to unwrap the package, lifting the sticky tape. Then open the package to reveal the contents! 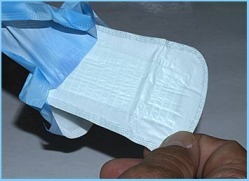 The back of the Sanitray Napkin is sticky. 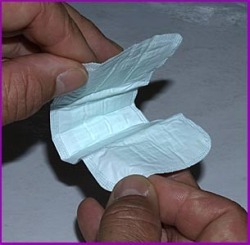 Note: Apparently this sticky side is normally used to hold the Sanitary Napkin to the inside of the users underpants - you wouldn't want to get the sides confused would you? - OUCH!! 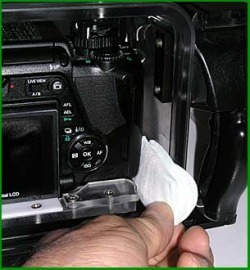 In our situation, we don't want sticky so fold the Napkin in half, with the sticky side inwards. Look for available space in the lower part of your housing to accommodate the Napkin, it may need folding again to fit. 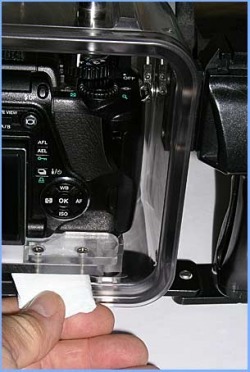 If there is room available, then try to fit 2 or even 3 under the camera base-plate and corners of the camera. Check to see that no parts of the Napkin are going to interfere with 'O' Rings/Controls or Sealing Surfaces. Don't cause a leak by using them! Now you are prepared to absorb and contain small to moderate amounts of sea-water from sloshing around inside your camera housing. It is reported that these Sanitary Napkins are capable of absorbing huge quantities of water. 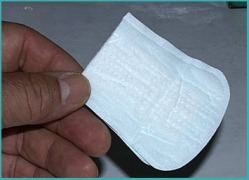 One acquaintance has told me that the particular pads his wife uses, could save a sinking submarine !!! !